I am pretty much the master mid-day snacker; I have the best of intentions each morning. I have a power bar in the car on the commute to work and a sensible lunch. I just have no idea what happens after 2 pm. My inner sweet tooth takes over and the next thing you know I need something fast! 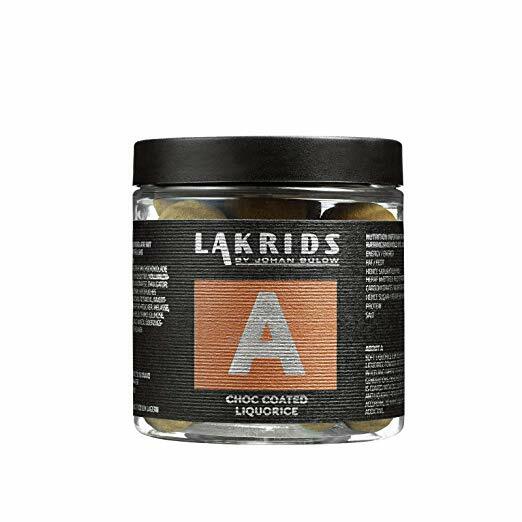 This week I had this awesome blogging opportunity to taste test Lakrids by Bulow; these are fantastically, luxury licorice balls. Options include chocolate , passion fruit, coffee, salt and caramel, habanero, cranberry and strawberry. They are bite-sized and perfect for my snacking needs! I love how different they are; Johan Bulow wanted to take his love of licorice and from 2007 and onward has concocted just amazing sweet creations! He started out creating licorice that you could smell 100 meters away and from there, with his team, the concept of coating licorice with flavors/chocolate was born. I have been sampling the chocolate and passion fruit coated flavors. You get an immediate taste of the rich cocoa/chocolate shell followed by that classic, delicious licorice taste. The passion fruit option couples the acidity of the passion fruit expertly with sweet chocolate – the end result for me was pure heaven. The sugar shell perfectly covers the chewy licorice. This is truly a quality snack. With regard to pricing; the 5.29 oz package will run almost $10 and the larger 12.69 oz package costs around $16.00. They also offer cool gift box options. With Easter coming, think gourmet gift basket for your holiday host! These are so different and will be loved! I love their website; reading Mr. Bulow’s story is so heartwarming. It is so nice to see someone so in love with their craft. They have this great blog that has recipes that will have your inner sweet tooth moaning in seconds! You simply must try them for yourself! Next Article Getting our Easter baking on with Domino Sugar!